"When Sonny Stitt came on the scene his fabulous technique really excited me." Sonny Stitt played alto saxophone in Tiny Bradshaw's big band in the early 1940s, then in 1945 joined Billy Eckstine's big band, which included such young bop players as Fats Navarro, Dexter Gordon, Gene Ammons, and Art Blakey. His association with the leaders of the new bop movement continued in Dizzy Gillespie's sextet and big band of 1946. During 1949-51 he began playing tenor and baritone saxophones as well as alto, often in a septet that he led with Ammons. Throughout much of the rest of his career he led a variety of small groups often assembling them ad hoc for each new engagement as he traveled from city to city. However, he rejoined Gillespie for a time in the late 1950s, replaced John Coltrane in the Miles Davis Quintet in 1960, played with Ammons again in the early 1960s, and from time to time worked during short tours with various all-star groups such as the Giants of Jazz (1971-72, with Gillespie, Kai Winding, Thelonious Monk, Al McKibbon, and Blakey). His last performance took place in Japan just a few days before his death. Stitt's early recorded solos show clearly that he was a disciple of Charlie Parker; he used Parker's favorite melodic formulas and imitated his tone quality and vibrato. Only small details of phrasing and articulation--an occasional slight hesitation in connecting notes in a Parkeresque phrase, or a subtly different way of tonguing--betray the imitator. 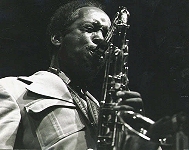 Over the years he gradually added a number of individual melodic formulas to his vocabulary, but Parker's influence always dominated his solos on the alto saxophone, even when he used the Varitone, an electronic sound-modifying attachment which he adopted soon after its appearance on the market in 1966. He probably turned initially to the tenor and baritone saxophones in an effort to escape his image as Parker's follower; the baritone instrument proved to be but a temporary diversion, but the tenor opened up new lines of musical thought for him. He made his most distinctive statements on this instrument, which he played frequently from 1950. A selected discography of Sonny Stitt albums. Sonny Stitt With Bud Powell And J.J. Johnson, 1949-50, Prestige. Sonny Stitt Sits In With The Oscar Peterson Trio, 1957-59, Verve. Salt And Pepper, 1963, Impulse! Last Stitt Sessions, 1982, Muse.